I had done a few long stitch kits by anchor. 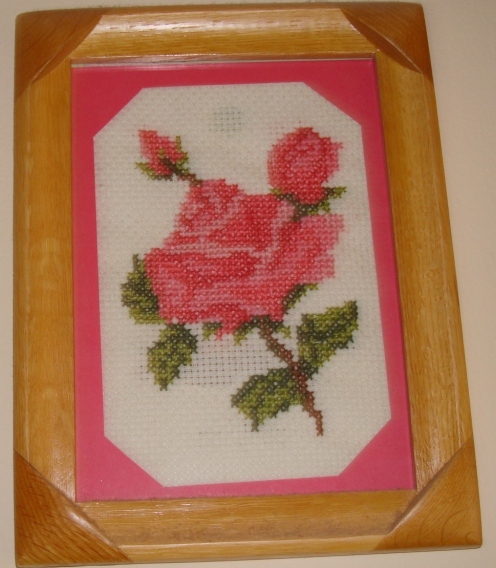 While browsing the net I found some pictures done in various needlepoint stitches. I too wanted to try some, but starting with a new venture chose satin stitch as the base.
. I bought this book-1000 great quilt blocks, leading me to chose from the block designs . 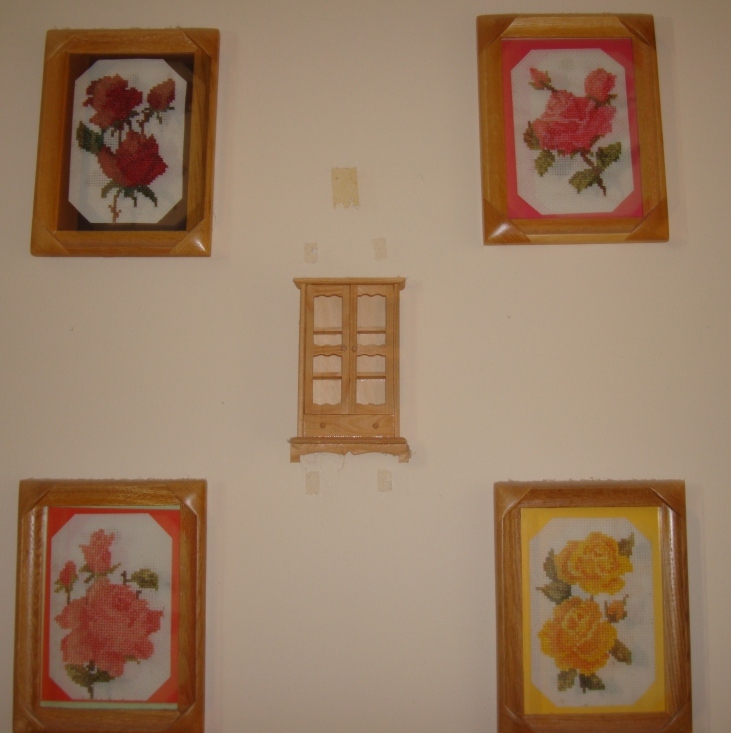 the square frames were from IKEA, after measuring the size of the square, I chose two block designs. Then the canvas was marked with pencil. These frames were meant to decorate my husband’s office room, later when he changed the office they came home. The pictures on my next posts.till then enjoy browsing these wonderful links. This is the last piece in this set of four roses. This is a big single rose with two buds. the design was taken again from the same set of books, this time from a cushion design. The book had a flower bouquet design for a cushion, I took the rose and the buds were lifted from other smaller bouquets. then they were all put together to form this particular frame. With this I complete this set. This was the first time I worked with evenweave aida cloth, earlier works were done in matti cloth bought in India, where the weave is rectangular. That made the patterns ablong instead of square . Any pattern will look compressed or elongated depending on how we use the matti. However much we work, there was always a sense of dissatisfaction, when the work was complete. I literally drooled over the aida cloth when I first saw it here. I sometimes use them on my tunics too. This whole thing started, with the idea of having one picture with red roses. 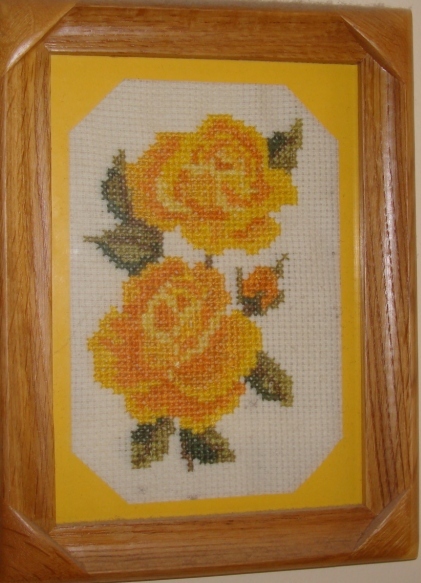 The pattern was chosen from the small cross stitch book, a border pattern. It was a wide border, the roses were quite impressive, I chose two roses and a bud from that, and then customized them to suit this frame. As seen in the picture, I wanted real dark red rose! The patterns were really small, a strain for the eyes.I used a graph paper to draw individually whichever colour thread I was working on at that time. This meant extra time to draw each and every colour on graph, but cross stitching was swift. Choose the colour, match it with the symbol, draw that symbols alone on graph, then do the cross stitching,then again start with the next colour. The last one is pink rose. 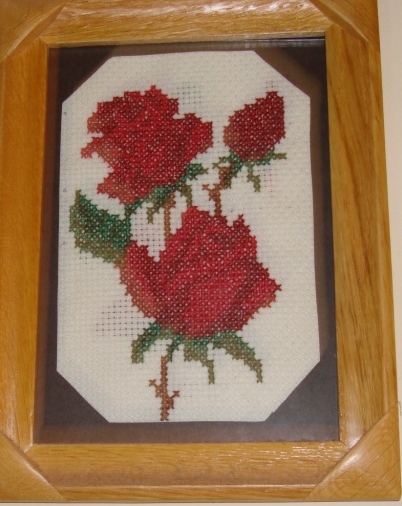 This frame is with two medium size roses with bud. The roses are yellow. Actually this pattern was used for the second time, when I initially bought the book, this pattern fascinated me so much that I did it on a tunic with waste canvas. But I can’t say it made me happy of the result. Why did I make medium blue roses? Iam still wondering! 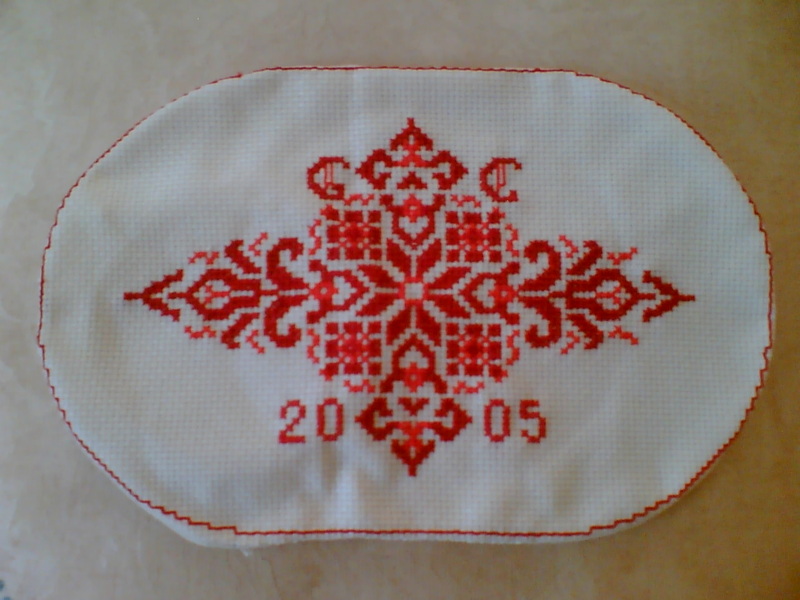 This pattern is done in aida cloth. When the piece was inserted to the frame, I added a yellow paper for the outline too. Not a bright idea definitely! I made these roses in 2004, when we first came to this house. The idea started with finding four wooden frames. I liked them so much, that wanted to do some flowers as a set. I had a few cross stitch designs books from India. 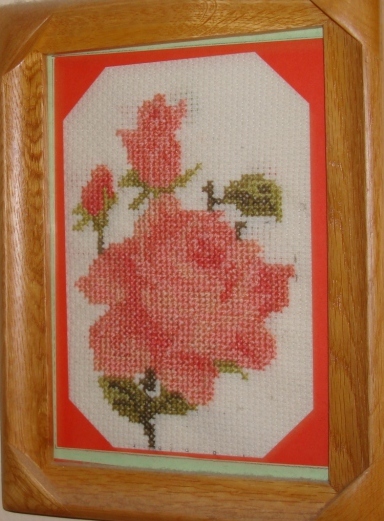 These were very small books which had cross stitch designs taken from other big cross stitch pattern books. the book size -10’ / 8’. The patterns were quite small too. After going through these books, I had a desire of doing some roses. From all the rose patterns I chose four. The choice was for two big roses with buds for two frames, and two medium roses for the other two.